Kwe Lay village in southeast Burma is small. About 40 miles from the Thailand border, the village has just 406 residents, most of them migrants looking for work in agriculture and timber production. They include 40-year-old Ko Maung Tun. Until three months ago, the father of three had been suffering from coughs and labored breathing for weeks. 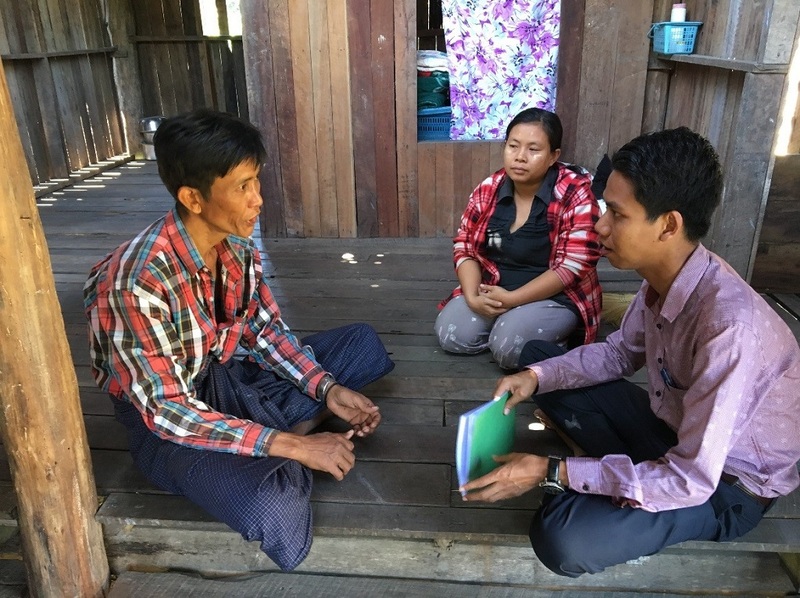 Thankfully, the village has an MCSP-trained Integrated Community Malaria Volunteer (ICMV), Nan Nyein Nyein Ei, who suspected that TB may be causing Tun’s symptoms and referred him to the Myawaddy Township Hospital for a sputum test for confirmation. MCSP’s training of 74 ICMVs like Ei is an innovative outgrowth of the country’s success against malaria. Cases of the disease have significantly declined since 2010, when the National Malaria Control Program began training and deploying more than 40,000 volunteers to conduct community-based malaria case detection, and to treat and refer severe cases of the disease. When Tun’s test proved positive for TB, he became depressed. As his family’s sole financial provider, he worried that the disease would affect his work and, as a result, the well-being of his children. Ei lifted his spirits by explaining that TB is treatable — and that the treatments are free of charge. Ei went on to underscore the importance of anti-TB treatment. 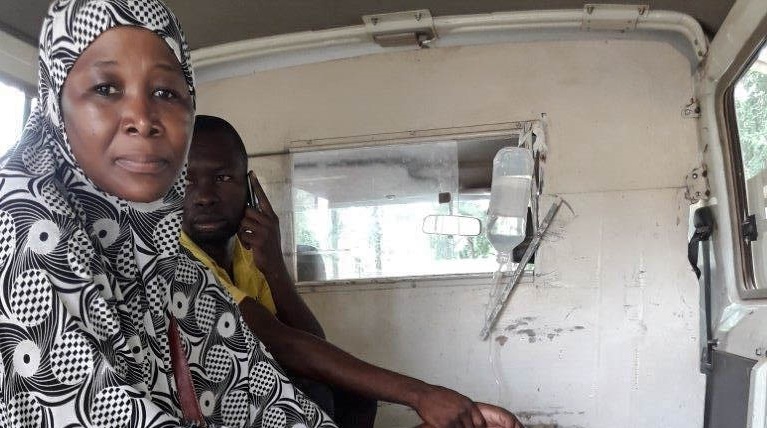 She was trained by MCSP to stress that medicines must be taken regularly to ensure their success, and that preventative and support measures should also be undertaken by Tun’s family to prevent the spread of the disease and speed his recovery. Before leaving, Ei left Tun and his family with health information pamphlets on TB outlying the same information. Above: Two of Tun’s three children were present when their father explained his experience with TB treatment to MCSP staff during a follow up visit. Tun’s children were not only screened for TB, but the eldest was also trained by the ICMV to assist his father with treatment. 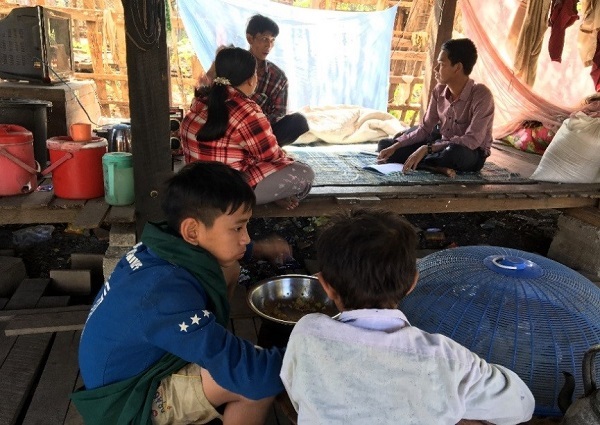 During the initial two weeks of treatment, Tun suffered from side effects of the anti-TB drugs, including dizziness, nausea, vomiting and loss of appetite. However, he kept going thanks to daily visits from Ei, who provided support while also explaining to Tun’s eldest son how best to care for his father during her absences. His son learned to remind his father to cover his mouth and nose when sneezing, take his medicine on time, and – if he began to feel worse – to go to the neighboring health facility for help. Due to the easy spread of the disease, Tun feared his children might also be infected. A month after his diagnosis, he had all three tested, and was greatly relieved when all tests came back negative. Three months into his treatments, Tun is feeling much better. The side effects have passed and, thanks to regular care and guidance on drug adherence from Ei, his coughs and labored breathing have ended, too. An increased appetite allowed him to gain weight and he’s even quit smoking to prevent his condition from worsening. He now feels confident that he will recover completely. Ten years ago, TB patients in Kwe Lay village were often discriminated against. Today, Tun represents a new kind of patient – one whose positive experiences with a trained ICMV and TB treatment have emboldened him to share his diagnosis without shame. He recently attended a TB health education session led by Ei, where he shared his story and encouraged community consultation with the ICMV. TB is curable, but still kills millions each year, and remains the leading cause of death from an infectious disease. Moreover, more than 95% of these deaths will occur in low- and middle-income countries like Burma – the very regions where MCSP is striving to prevent needless deaths and help communities thrive. But TB patients like Tun – and ICMVs like Ei – are helping to turn this tide. Working together, Tun overcame his depression about his initial diagnosis, committed to treatment, and is now an advocate in his community for early detection and treatment of the disease. To learn more about MCSP’s work in TB, click here.